Hi – my name is Nina Anderson . 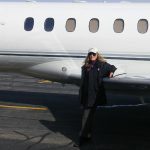 As a corporate pilot flying a Hawker jet I was so tired of not having anything to drink at airports except soda pop or plain water. I also did some research and found I needed electrolytes to help from getting dehydrated while flying at altitude. All of the electrolyte drinks I could buy either had sugar or artificial sweeteners plus dyes and other stuff I didn’t want to put in my body. I also knew that most bottled water was purified which removed lots of the electrolytes. I got together with my friend Leila Baroody, who owned a Cherokee Archer and had the same concerns. So we decided to make our own. The result is electroBlast. I worked with a company that had been using the proprietary formula for many many years and decided that was just what I needed in my concentrate. I didn’t want to carry around big bottles of the stuff so had it packaged in a concentrate form that I could just put in any water bottle. The lemon-lime was just sweet enough for me, but sometimes I wanted just plain water so we developed the unflavored version so I could just pump into any beverage. Many of my friends have told me that this helped them with their jet lag, hangovers, joint pain, heart palpitations and athletic endurance. I have found that since I have been using it my fingernails are super strong, my hair isn’t turning gray anymore, my heart palpitations stopped completely, my knee pain has gone away and I don’t get fatigued like I used to. I also can think better in the airplane, which I’m sure my passengers appreciate. Maybe all these symptoms aren’t relieved by just the electrolytes but I know they help. Isn’t that what hospitals give you when you are sick? It seems we are a electrolyte-trace mineral deficient society…little in the soil so food is becoming mineral deficient, purified water which removes many of the minerals, and vitamin supplements that may choose the wrong minerals (big ones can’t get absorbed nearly as well as the tiny kind that we use). I always tell people that electrolytes are the spark for your brain and body’s battery and the foundation of your personal house. If that foundation is weak the rest of your body will suffer and eventually fall down. We’ve experienced good results and are very happy we have electroBlast in our flight bag.